Forget your "same old, same old" lentil soup and take a deep breath. Can you smell the cumin, the coriander, the whiff of cinnamon? Open your eyes and take in the burnt-orange glow of turmeric burnished with tomatoes and sweet paprika. Lentil soups may come and go, but this concoction will stick in your memory, not just for its heady aromas and hearty texture, but also for its ease and versatility. 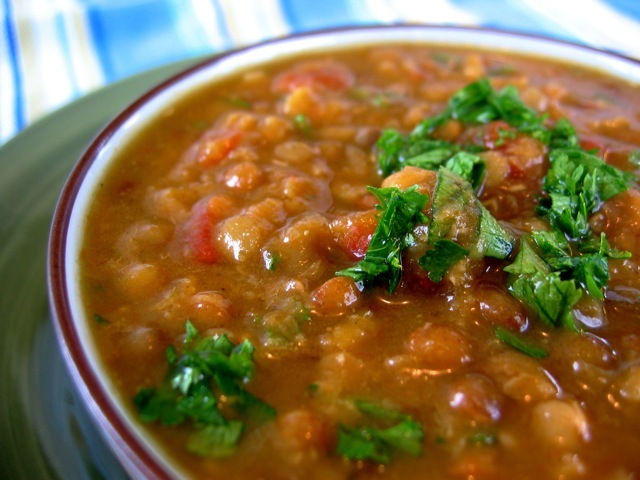 Unlike dried beans, red lentils don't need to be soaked before they're cooked. You can substitute 2 cups small dried white beans, soaked overnight, for the lentils. For a meaty soup, sauté 1 pound boneless, skinless dark chicken meat or leg of lamb, cut into 1/2-inch pieces, until browned; add the onion and proceed with the rest of the recipe. Heat the olive oil in a large Dutch oven or saucepan over medium-high heat. Add the onions and cook until tender, about 3 minutes. Add the garlic, coriander, cumin, turmeric, paprika, cinnamon, salt, and pepper, and cook for another minute. Add the broth and tomatoes and heat to boiling. Pour the mixture into a 5- to 6-quart slow cooker. Stir in the lentils, cover the cooker, and cook for 4 to 5 hours on high, or 8 to 10 hours on low, until the lentils are tender. Stir in the pepper flakes, lemon juice, parsley, and cilantro, cover, and cook on high for 10 minutes. Serve hot. Culinate editor's notes: If you don't have a slow cooker, simply finish cooking the dish in the Dutch oven you start out using; the soup will be done much quicker, in about an hour or so. One onion is plenty for this recipe. If you don't have 7 cups vegetable broth, use 1 quart (4 cups) vegetable broth and 3 cups water (you can also use chicken stock, if you prefer). Since canned tomatoes come in standard sizes of 14 1/2 and 28 ounces, not 20 ounces, use a 14 1/2-ounce can. And if you don't have a fresh lemon handy, sprinkle some red-wine vinegar into the soup just before serving.